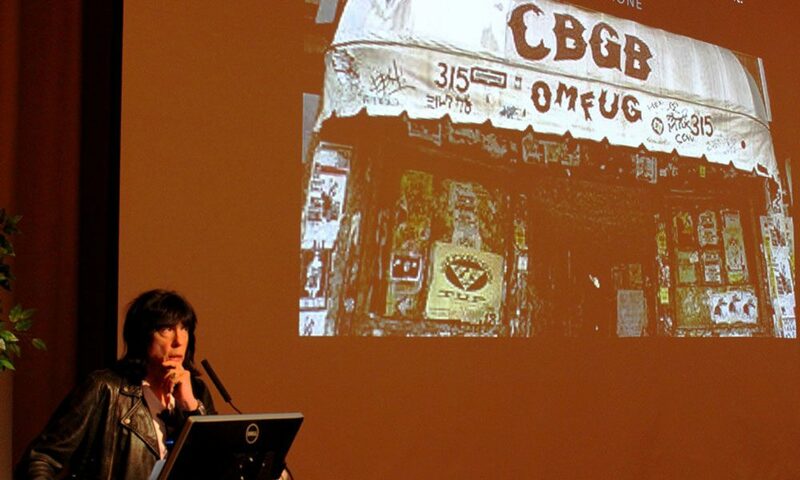 The Ramones drummer speaks at Skidmore College. Draped in a black leather jacket and donning dark mirror shades, Marky Ramone carried an auditorium filled with young Skidmore College students and middle-aged punk rockers alike on a verbal journey that began with his modest Brooklyn upbringing and was highlighted by a 15-year stint as the drummer for The Ramones. After touring England in support of The Clash as a member of Richard Hell and the Voidoids, Bell returned to New York where he lived in a cold water flat on Avenue A and 9th Street. It was a dangerous place in a dangerous time. In the spring of 1978, he was approached with an offer by Dee Dee Ramone about a vacancy in the band. “I was at the bar at CBGB’s one day and Dee Dee goes, ‘Marky, you wanna join the Ramones?’” He learned 40 songs in two weeks, played his first of 1,700 live shows with the band, in Poughkeepsie, and headed to the studio where he recorded the first of nine studio albums as a Ramone. “The first song I recorded was ‘I Wanna Be Sedated.’ Anybody ever hear it?” he asked an enthusiastic crowd at Skidmore, where the talk was sponsored by the college Student Entertainment Company and Skidmore Speaker’s Bureau. Senior Veronica Monroe, who helped organize the event, introduced the guest speaker to the audience and explained she first started listening to The Ramones at the request of her father when she was a child, and now she was in the process of completing her senior thesis on the topic of punk rock. The Ramones played their final show in 1996. “When The Ramones albums came out, they weren’t selling,” the drummer explained, as a large screen behind him displayed images of his friendship with Phil Spector, his acting role in the film Rock ‘n’ Roll High School, and accolades from The Rock and Roll Hall of Fame, The Grammy Awards, and MTV.